Cyril of Alexandria (c. 378 - 444 C.E.) was the Christian patriarch of Alexandria when the city was at its height in influence and power within the Roman Empire. He distinguished himself by using his position to champion the orthodox faith against Jews and heretics. Cyril's fame as a saint resulted from his leadership in the Christological controversy against Nestorius, Patriarch of Constantinople, in which Cyril promoted the title of Theotokos (God-bearer) for the Virgin Mary. Cyril wrote extensively during this struggle, in which he was closely allied with Pope Celestine I. He was also the central figure in the Council of Ephesus in 431, which led to the deposition of Nestorius, although Cyril himself was deposed by a rival synod. Cyril is also noted for his harsh treatment of his opponents generally. Early in his episcopate, in 412, he expelled the Novatianists from their churches and seized the contents of their sacred treasuries. He then led the Christians in the violent expulsion of the Jews from Alexandria in 415. In his resultant struggle with the imperial governor, Orestes, Cyril's followers stoned Orestes and were implicated in the hideous slaying of the respected Alexandrian female philosopher Hypatia. Cyril was named a Doctor of the Church in 1882, and his orthodox reputation within the Christian world led to his acquiring the title of "Seal of all the Fathers." His feast day is celebrated in the Western Church on January 28; in the East it is honored either on June 9, or (together with with his fellow Alexandrian Athanasius) on January 18. The location of Alexandria is shown in yellow, to the northwest (click to enlarge). Cyril was born about 378 in the small town of Theodosios, Egypt, near modern day Malalla el Kobra. His mother’s brother, Theophilus, was a priest who rose to the powerful position of "pope" (patriarch) of Alexandria. Under his uncle's guidance, Cyril was well educated. His education showed through his knowledge, in his writings, and his influence on other Christian writers of his day. Although considered one of the Greek Fathers, he demonstrated a knowledge of Latin through his extensive correspondence with the bishop of Rome, Pope Celestine I. His formal education consisted of grammatical studies at ages 12 to 14 (390-392 C.E. ), rhetoric and humanities at ages 15 to 20 (393-397), and Christian theology and biblical studies in his 20s (398-402). He was tonsured and ordained as a reader by his uncle Theophilus in the Church of Alexandria and soon advanced in position. He accompanied Theophilus to Constantinople for the "Synod of the Oak" in 402. There, Cyril supported the ouster of John Chrysostom as archbishop of Constantinople on administrative grounds, although Chrysostom's association with Antioch and his support of Origenism also seem to have been a factor. Later Cyril supported John's return. After Theophilus died in October 412, Cyril was made pope (patriarch) of Alexandria on October 18, over the opposition of the party supporting the archdeacon Timothy. A riot resulted, as the position had become powerful and influential, rivaling that of the prefect (mayor) in a city known for its competing pagan, Jewish, and various Christian factions. On the third day after the death of Theophilus, Cyril came into possession of the episcopate, with greater power than Theophilus had ever exercised. For from that time the bishopric of Alexandria went beyond the limits of its sacerdotal functions, and assumed the administration of secular matters. Cyril immediately therefore shut up the churches of the Novatians at Alexandria and took possession of all their consecrated vessels and ornaments; and then stripped their bishop Theopemptus of all that he had. Cyril, accompanied by an immense crowd of people, going to their synagogues—-for so they call their house of prayer-—took them away from (the synagogues) and drove the Jews out of the city, permitting the multitude to plunder their goods. Thus the Jews who had inhabited the city from the time of Alexander the Macedonian were expelled from it, stripped of all they possessed, and dispersed some in one direction and some in another. Cyril and his followers are sometimes blamed for burning the Library of Alexandria during this rampage, although there is no agreement among historians regarding this. After Cyril and Orestes both appealed to the emperor regarding the matter, some 500 zealous monks from Nitria descended on the city in support of Cyril's cause. They confronted Orestes and stoned him nearly to death, accusing him of paganism and idolatry over his protestations that he was a baptized and believing Christian. Artist's concept of Hypatia of Alexandria, murdered by a pro-Cyril mob because of her association with Orestes. It was calumniously reported among the Christian populace that it was she who prevented Orestes from being reconciled to the bishop. Some of them, therefore, hurried away by a fierce and bigoted zeal,... (and) waylaid her returning home. Dragging her from her carriage, they took her to the church called Cæsareum, where they completely stripped her and then murdered her with oyster shells (or roofing tiles). After tearing her body in pieces, they took her mangled limbs to a place called Cinaron, and there burnt them. This affair brought not the least opprobrium, not only upon Cyril, but also upon the whole Alexandrian church. Cyril greatest fame, however, was won in the context of the rivalry between the Alexandrian and Antiochene schools of theological reflection. Before becoming patriarch, Cyril had supported his uncle Theophilus to achieve the deposition of the Antiochene Saint John Chrysostom from the position of patriarch of Constantinople. 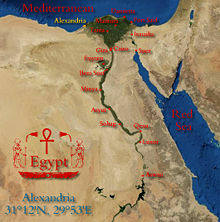 During his own reign at Alexandria, Cyril reportedly faced troubles with the Antiochene-oriented Christians in Egypt. These issues came to a head in 428 when the see of Constantinople became vacant and Nestorius, from the Antiochene school, was named patriarch. 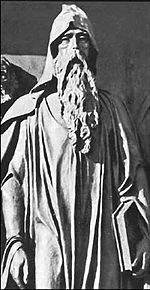 Nestorius, the Antiochene bishop of Constantinople who became Cyril's arch-rival. Against Nestorius, Cyril taught the use of the term Theotokus—referring to the Virgin Mary as "God-bearer"—in his Easter letter for 429. "I am amazed that there are some who are entirely in doubt as to whether the holy Virgin should be called Theotokos or not," Cyril wrote. "For if our Lord Jesus Christ is God, how is the holy Virgin who gave [him] birth, not God-bearer [Theotokos]?" A correspondence with Nestorius followed. Nestorius insisted that Christokos was sufficient in honor and more accurate theologically, since Christ embodies both God and man, not God alone. He sent his sermons to Pope Celestine I, but he received no reply. The pope, meanwhile. wrote to Cyril for further information, having become suspicious of Nestorius for offering hospitality to certain Pelagian clerics whom the pope had condemned. Celestine viewed Cyril not only as the leading prelate of the East, but also as the inheritor of the orthodox tradition of Athanasius, champion of the orthodox case against Arianism. The admiration of the two patriarchs was mutual, as Cyril affirmed that he must, by ancient custom, consult with the pope on a matter affecting spiritual welfare of the empire. He encouraged Celestine to communicate his opinion on the matter to the bishops of Macedonia and of the East, including Antioch itself. Celestine dispatched a letter condemning Nestorius' views to Cyril, with enclosures to Constantinople, Philippi, Jerusalem, and Antioch. He commissioned Cyril to act with the authority of the Roman See and to admonish Nestorius that unless he would recant within ten days from the receipt of this ultimatum, he would be excommunicated. Moreover, if Nestorius would not submit, the pope took it upon himself to place Cyril in charge of Church of Constantinople. If anyone does not confess that Emmanuel is God in truth, and therefore that the holy virgin is the mother of God, for she bore in a fleshly way the Word of God become flesh, let him be anathema. Cyril wrote also to John, Patriarch of Antioch, informing him of the facts and insinuating that if John should support his old friend Nestorius, he would find himself isolated and at odds with Rome, Macedonia, and Egypt. John took the hint and urged Nestorius to yield. After much infighting, Augusta Pulcheria, older sister of the Emperor Theodosius II, sided with Cyril against Nestorius. Nestorius recommended to the emperor that an Ecumenical Council be convened in Constantinople. Theodosius did call the council, but in Ephesus, a city friendly to Cyril. Nestorius responded by preaching publicly against Cyril as a slanderer, and of having used bribes to achieve a situation favorable to himself. However, he also offered an olive branch by declaring himself willing to use the Theotokos to describe the Virgin. He sent these sermons to John of Antioch, who was inclined to accept them as evidence of Nestorius' orthodoxy. However, Nestorius also issued 12 propositions of his own, with appended anathemas. His statements highlighted Cyril's tendency to deny the two natures (divine and human) of Christ, but they also emphasized his own tendency to draw the distinction between Christ's divinity and humanity too starkly. When he arrived with the imperial commissioner, Count Candidian, and his own friend Count Irenaeus, Nestorius found the churches of Ephesus closed to him. Cyril of Alexandria, shown holding an icon of the Theotokos. Cyril, on the other hand, came to Ephesus with 50 of his bishops. Palestine, Crete, Asia Minor, and Greece added their delegations to these. However, John of Antioch and his bishops were delayed. Cyril may have believed that John did not wish to be present at the trial of his old friend, or that he wished to gain time for him. A more cynical appraisal might be that he simply took the opportunity to keep John's influence out of the deliberations. In any case, he opened the council without John, on June 22, 431, in spite of the request of 68 attending bishops for a delay. Cyril's decision would cast a shadow of the council's findings, resulting in the bishops of the Antiochene school forming a rival council after the fact (see below). Cyril's impatience had unfortunate results beyond the exclusion of the delegation from Antioch, for the legates from Rome also had not arrived. Cyril at this point had no answer to a letter he had written to Celestine asking "whether the holy synod should receive a man (Nestorius) who condemned what it preached." He himself took the place of council president. Nestorius was now summoned to appear in order that he might explain his refusal to respond to Cyril's former admonition. He, however, refused to receive the four bishops whom the council sent to him. Consequently nothing remained but formal procedure to condemn him for heresy. The council declared that it was "of necessity impelled" by Church law and by the letter of Celestine to declare Nestorius deposed and excommunicated. John of Antioch and his party arrived a few days later. Sensing treachery, they formed themselves into a rival council of 43 bishops and deposed Bishop Memnon of Ephesus as well as Cyril, accusing the latter of Apollinarianism and even of Eunomianism. The papal legates, who had been detained by bad weather, arrived on July 10, bringing with them an offer from the pope at Rome to grant Nestorius forgiveness if he should repent. Their only role now was to confirm what had already been decided. Both Cyril's party and the Antiochans now appealed to the emperor, who took the decision to treat Nestorius, Cyril, and Memnon as being all three lawfully deposed. Each of them was initially kept in close custody, but eventually the emperor took the orthodox view. Cyril was allowed to return to his diocese, and Nestorius went into retirement at Antioch. Later he was banished to the Great Oasis of Egypt. Meanwhile Pope Celestine died. His successor, Pope Sixtus III, confirmed the council and attempted to get John of Antioch to anathematize Nestorius. For some time Cyril was opposed by Bishop Theodoret of Cyrrhus, Syria; but eventually he reconciled his views with those of Cyril. John of Antioch, meanwhile sent Bishop Paul of Emesa as his plenipotentiary to Alexandria, and he too made peace with Cyril. Though Theodoret still refused to denounce an earlier defense of Nestorius, John did so, and Cyril declared his joy over this in a letter to John. Cyril composed many further treatises, dogmatic letters, and sermons. He died in June, 444, after an episcopate of nearly 32 years. Cyril was a scholarly archbishop and a prolific writer. In the early years of his active life in the Church he wrote several exegeses. Among these were: Commentaries on the Old Testament, Thesaurus, Discourse Against Arians, Commentary on St. John's Gospel, and Dialogues on the Trinity. From 429 onward, as the Christological controversies increased, his output was unmatched by either his opponents or his colleagues. His writings and his theology have remained an important part of the tradition of the Church Fathers to this day. At the same time, it is undeniable that Cyril's temperament was confrontational, even divisive. Even when he was right theologically, his attitude toward heretics in general and Nestorius in particular exacerbated controversies beyond the point of no return. His attitude toward the Jews was even less pacific, and the precedent he set of violently expelling the Jewish community from Alexandria stands as a shameful reminder of Christian anti-Judaism for which the Catholic Church only recently was compelled to apologize. Nor can Cyril be excused entirely for his followers' brutality in the murder of Hypatia. Although Cyril proved victorious in the short run against Nestorius, the controversies initiated by him and and his adversary were to continue for decades, from the Robber Council of Ephesus in 449 to the Council of Chalcedon in 451 and beyond. As a champion for orthodoxy, Cyril had few equals; but as a practitioner of Christian love toward one's enemies, his saintly status is questionable. ↑ Preston Chesser, The Burning of the Library of Alexandria, eHistory.com. Retrieved June 11, 2008. ↑ Cyril becomes bishop of Alexandria www.ccel.org. Retrieved June 10, 2008. ↑ James Everett Seaver, (University of Kansas Publications, 1952), "The Persecution of the Jews in the Roman Empire (300-428)" vlib.iue.it. Retrieved June 11, 2008. ↑ Of Hypatia the female philosopher www.ccel.org. Retrieved June 11, 2008. This article contains text from the Catholic Encyclopedia (1913), a publication in the public domain. All links retrieved November 21, 2017. History of "Cyril of Alexandria"
This page was last modified on 21 November 2017, at 15:32.